The album was released on February 2, 2018. Philharmonix is a popular ensemble in Vienna, made up of members from the Vienna and Berlin philharmonics; these artists merge classical music with jazz, klezmer music, world-music and even with pop music within their project, however classical creations hold the dominant percentage. All of these are tied together through an unmistakable and attractive style, with a distinguished sense of humour based on the idea that classical music needs to create entertainment, relaxation, and joy. What is this ensemble's recipe for success? The artists themselves gave us the answer: the fact that they get together to compose music only when they have something to say, when a new musical idea inspires them. There is never room for routine or obligations when it comes to the Philharmonix project, there is only passion and desire to make the audience happy. The Vienna Berlin Music Club was thus born on February 2nd at the Deutsche Grammophon music company. The record consists of contemporary pieces, some of which written by members of the Viennese ensemble themselves, such as Stephan Koncz or Sebastian Gürtler, but also well-known pieces from the universal classical repertoire, composed by Erik Satie, Camille Saint-Saens, or Edvard Grieg, which were recorded by the Philharmonix ensemble in their own version. The original performance of the ensemble delivers good humour and is full of verve. The Austrian group is made up of seven instrumentalists, each of them having their own musical projects as well. Two of them are members of the Berlin Philharmonic - the violinist Noah Bendix-Balgley and the cellist Stephan Koncz, who is also a talented composer; three of them are working for the Vienna Philharmonic - viola player Thilo Fechner, clarinettist Daniel Ottensamer, who comes from a famous family of musicians in Austria, and contrabass player Ödön Racz, an artist born in Budapest and schooled in Vienna, who in 2016 recorded a well appreciated album with concertos for contrabass and orchestra which was broadcasted on Radio România Muzical radio station as well. The other two members of the ensemble are violinist and vocalist Sebastian Gürtler, who makes up musical arrangements for most of the songs which are performed, and pianist Christoph Traxler, one of the most versatile and talented young pianists in Austria, who concerted as soloist alongside prestigious ensembles such as Staatskapelle Halle or The Vienna Philharmonic Orchestra, but who is also developing numerous cross-over projects. Thus, the Philharmonix ensemble has a valuable structure, and the success of the band did not take long to come. Regarding the way in which they make music, the seven members talk about it in an interview to promote their album: "Usually, one of us brings a piece which he really wants to perform, and which will easily fit into one of our thematic programs. Sometimes, Sebastian Gürtler, who is in charge of musical arrangements, says he does not like that particular work at all, but after some quality time spent with the piece, there is a certain Eureka moment in which he finds a fresh way to adapt the notes to our band, putting it into a completely different light. "The result of what the Philharmonix group accomplishes is always astonishing and the interaction with the audience carries a particular energy. The Vienna Berlin Music Club record begins with Freddie Mercury's Bohemian Rhapsody, in an arrangement which humorously combines the notes of the famous song with bits of classical works and even with traditional Irish music, but also with different and contrasting manners of interpretation. In the beginning, the artists' interpretation carries us towards the pretentious atmosphere of an aristocrat hall with chamber music, where the cello passionately conveys the well-known main theme. Then, the song resumes in a different style and its character changes drastically, with exciting rhythms, an ingenious orchestration and spectacular sound colours with Musical elements, and in the end, it reverts to the peaceful chords from the beginning of the piece. Whether you are fans of the legendary Freddie Mercury's work or not, I think you will be astonished by this version made by the Philharmonix group. The interpretation is flawless and so is the lightness with which the ensemble oscillates between musical styles. Up next is the Hungarian Dance no.1 by Johannes Brahms and Milonga Loca, a famous Argentine tango by Astor Piazzolla, then three pieces written by Stephan Koncz, a young cellist and composer born in 1984, who comes from an Austro-Hungarian family made up of musicians and who studied at the Conservatoire of Vienna, his hometown. He has also participated in masterclasses held by Daniel Barenboim, Steven Isserlis and Tamas Varga and gave recitals and concerts on prestigious European stages. He was a part of the Vienna State Opera Orchestra and of the Berlin Philharmonic, but he was also a member of the Berlin Baroque Soloists and Philharmonix ensembles. Appreciated in the field of interpretative art, Stephan Koncz is also preoccupied with composition, which he studied at the University of Music and Performing Arts in Vienna. His style is complex, as you will be able to notice in the following minutes, the sound structures - which are sometimes influenced by twentieth century composers or Balkan folklore - have a personal touch, with elaborate and pithy rhythms and a brilliant orchestration, filled with colourful sound effects. From Stephan Koncz's works, the ones which are included on the Philharmonix album are A New Satiesfaction inspired by Erik Satie's music, followed by Balkan Party, a work in which we can even observe notes of Romanian traditional music, and the Russian Overture, in which the composer skilfully combines Russian traditional songs with tunes of classical music. The musicians' interpretation is explosive, and the vigorous rhythms and effervescent sound colours are a clear characterization the Philharmonix ensemble's style. I have also noticed that this album included the piece Der Herrgott und die Geige, written by Sebastian Gürtler, a musician who was the concertmaster of the Vienna Volksoper Orchestra between 1997-2008, who also concerted as soloist with the Romande Suisse Orchestra, the Dresda and Vienna philarmonics and who initiated numerous projects dedicated to chamber music. Within the Philharmonix ensemble, he is a composer, an arranger, a violinist, and a vocalist for the works which contain vocal parts. The work entitled Der Herrgott und die Geige (God and the Violin) is a song with humoristic texts, inspired by traditional Austrian music. Then comes The Elephant from Camille Saint-Saens' The Carnival of the Animals suite, Baby Elephant Walk by Henry Mancini and Englishman in New York by Gordon Summer, all of them in the arrangement and interpretation of the Philharmonix ensemble. 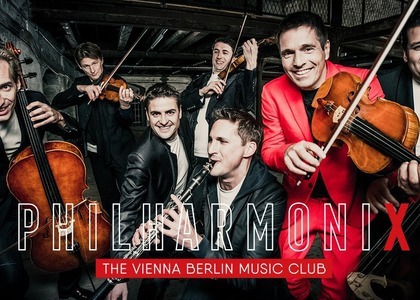 For a unique sound experience, a performance filled with good humour and verve, I invite you to listen the Philharmonix album- The Vienna Berlin Music Club on the 19th and 20th of April 2018, at CD Review (starting at 11:30 a.m) part of the Arpeggio radio show.